On the pervasive mis-recollection of Star Trek and the women who built its legacy. Though media, celebrities and fans alike have lauded Star Trek: The Original Series (or TOS) for its inclusive casting—the bridge crew features a Black woman and Asian man and also a Jewish man in one of the two leading roles—I’ve often felt skeptical of the show’s claims to progressiveness. Perhaps I’m too young, and my inability to see why generations of fans call it forward-thinking is a sign of how far we’ve come in the fifty years since it premiered. Whoopi Goldberg famously discussed how gleeful it made her as a child to see Nichelle Nichols as Lieutenant Uhura on the screen, later inspiring her to play the character Guinan on The Next Generation. A black woman was on a major network, and she wasn’t a maid, Goldberg said. My mother watched TOS from the beginning, an eight-almost-nine-year-old little black girl at the time. Indeed, despite being chronically underwritten, Nichols’s charisma and talent brought daring personality to the part of the communications officer. The role even inspired real-life black astronaut Mae Jemison to make her way to the stars. Star Trek aired for the first time on September 8, 1966. NBC executives chose “The Man Trap” for the premiere because they believed its horror elements would entice viewers. Two years earlier, the wildly popular and well-reviewed Twilight Zone had completed its run. Though rarely discussed as contemporaries, the original Twilight Zone series accomplished much of what Star Trek writers sought to do: use fantastical, speculative, and often deeply disturbing situations to offer commentary on the dark realities of human nature and Western civilization. Star Trek had a number of series from which to draw themes and inspiration, divided loosely into two categories. The first—adventurous, often humorous science fiction, as demonstrated by Lost in Space (1965-1968), Doctor Who (1963-), and The Jetsons (1962-1963). The second—speculative works more serious and gritty in tone, such as the previously discussed Twilight Zone, The Outer Limits (1963-1965), Dark Shadows (1966-1971), and Voyage to the Bottom of the Sea (1964-1968). Star Trek , though remembered as light, goodhearted, and fun, fit more easily into this second, darker category of speculative fiction. After “The Man Trap’s” broadcast, critics called it disgustingly violent, criticizing the volume of killing and the distasteful nature of the villain, the salt vampire. Though subsequent Star Trek episodes would have a different feel—“The Man Trap’s” writer, George Clayton Johnson, wrote multiple telescripts for the Twilight Zone as well as co-authored the dystopian novel Logan’s Run—the show often veered toward horror. The pervasive mis-recollection of Star Trek by a wide range of audiences, as demonstrated by Goldin’s quote, doesn’t just speak to the issue of whether or not the show’s multi-ethnic cast was enough to earn it a label of progressivism. It’s indicative of how we, as a culture, remember the show in a way that does not reflect what the show was, and it begs a question: why do we do that? Its utopian optimism. Most episodes of TOS feature the crew of Enterprise nearly dying at the hands of genocidal aliens, escaping in the nick of time, but not without racking up an absurdly high number of casualties. In one episode, “The Enemy Within,” a version of Captain James T. Kirk attempts to sexually assault Nurse Chapel. In “Mudd’s Women,” a charismatic cult leader exploits a harem of women. In “Charlie X,” nice guy Charlie makes Yeoman Rand disappear after she repeatedly rejects his sexual advances. He steals Uhura’s voice. And who can forget that horrifying image of Charlie wiping away a woman’s face, erasing her? Star Trek was the stuff of nightmares. In “Amok Time” we discover that in Vulcan society, marriages between children are arranged so that when Vulcan males go through a kind of sexual heat, they have a woman readily available with whom to mate. The only way for a woman to avoid this was to… marry a different man, if she could get him to fight her betrothed to the death. Star Trek was full of dark morality tales and never shook off the violence and horror of “The Man Trap,” from the murderous child cult in “Miri,” to the serial killer entity who murdered women on multiple planets in “Wolf in the Fold.” In “The Doomsday Machine” Commodore Matt Decker of USS Constellation deals with intense mental trauma after discovering a colossal, miles-long machine that destroys planets then eats the debris. Star Trek was also an unrepentantly feminist show. By that I mean it was a series that was deeply concerned with the violent nature of patriarchy. Though Captain Jim Kirk is the head of Enterprise, many of the show’s narratives reveal skepticism toward men in power. It was one of the few shows at the time to say men, as a class, can be consistently and unjustifiably exploitative. The series was still sexist, of course—it was the 1960s—and it did fall into some misogynist traps, for example, excessively depicting violence against women. However, it also took a firm stance against sexual violence and sexual exploitation in ways that were forward-thinking for the time. This is because women have always had a hand in shaping the show. Dorothy Catherine Fontana, who went by D.C. Fontana professionally to avoid anti-woman prejudice in the television world, was a part of Star Trek’s creative development from the very beginning. She transformed Gene Roddenberry’s story idea for “Charlie X” into teleplay format, and co-wrote the classic episode “This Side of Paradise,” among others. Fontana worked as a story editor for numerous Star Trek scripts, often completely revamping them and writing them herself, and came up with and developed a number of original ideas for episodes. The show was a production of Desilu, the company owned solely by Lucille Ball of I Love Lucy (she’d bought out her ex-husband Desi Arnaz at this point). While competitors rejected the show, and some of Ball’s advisors warned her against acquiring it, she decided to produce it anyway. She fought tirelessly to have the series renewed for a second season. A devoted fan, Betty Jo Trimble, led a letter-writing campaign to get TOS back on the air for a third season, resulting in over 100,000 letters to executives. Her work helped unify a disparate fandom into something tangible, cohesive and powerful. The first exclusive Star Trek fanzine, “Spockanalia,” was created and edited by two women: Devra Michele Langsam and Sherna Comerford. Participants and organizers of early Star Trek conventions, which took place after the series was canceled, were largely women, with men coming on board in large numbers only later. Star Trek ’s success and social prominence had little to do with the politics of the casting and the progressiveness of the storylines, and everything to do with the labor women directly involved in building the series and its fandom. Fan pressure is what kept the show alive long after it should’ve died, resulting in the Emmy-award winning Star Trek: The Animated Series (produced and run by writer Dorothy C. Fontana), Star Trek: The Motion Picture, and of course, Star Trek: The Next Generation. When we excessively praise the show as popular because of its (actually, not often) progressive politics, credit goes singularly to Gene Roddenberry and his vision. In Maloney’s piece, Star Trek’s forward-thinking ways are “thanks largely to the (at the time) radical philosophy of creator Gene Roddenberry,” and how “[i]n the future, Roddenberry envisioned race and gender as non-issues.” It necessarily dismisses the unique voices of the women who built the show up from the ground, alongside Roddenberry. 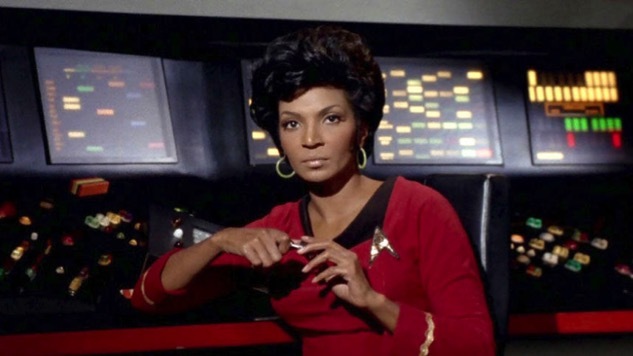 It dismisses Nichelle Nichols, who persisted when she had every reason to leave the show in pursuit of better-written parts. It dismisses me, a woman who loves the show not because of its culturally manufactured utopianism, but because of its dark, sinister, tangled exploration of gender and power, of colonialism—not at all a prediction of the future, but an accurate portrayal of the unequal world of the 1960s, and of today. Hikaru Sulu, played by Takei, once told Lieutenant Uhura, “I’ll protect you, fair maiden,” to which she replied, “Sorry, neither,” implying she is neither pale, nor a virgin. So when fans call the show a progressive utopia, I’m afraid I have to answer the same way. Sorry. Neither. Acknowledging these realities—behind the scenes and in front of the camera—of the show, doesn’t weaken the fandom, but idealizing and mis-remembering how Star Trek was, and how it came to be, leaves out the stories and the women critical to its legacy. Rivers Solomon writes about life in the margins, where they are firmly at home. Based in Cambridge, UK but originally from the US, they received their MFA from the Michener Center for Writers. You can find them on Twitter.